I had two important missions this year: getting to move around in the Chemistry Department UKM, and getting to know Azizah, and vice versa getting me known to her. In the department, the head was Dr Jamjan Rajikan, who returned from Australia in the middle of 1975; ironically I met him for the first time in the Village, Salford on Sep 11 Thu 1975 when he was on UK tour. Others were Dr Ariffin Aton who I had met in Leeds, also in 1975, Dr Akram Che Ayob who I had not met before (Loughborough), Dr Suwandi (a naturalised Indonesian) who returned from Syracuse in 1972, from whom I studied polymer chemistry; Sri Nuresteri who returned from New Zealand in late 1975, and with whom I shared the office. The juniors were Md Soot and Md Pauzi, of my batch, Dr Sukiman and the remaining Indonesian, Dr Sjamsul. Some volunteers extended to become contract lecturers for a while: Dr Roger Card, and Dr Paul Rusmussen. Dr Noramly had since been seconded to PUSPATI, of which the deanary was passed on to Dr Ishak Tamby Kechik who was rather senior. The department was waiting for the return of many more from the oversea: Wahid Samsudin, Hamid Othman, Wan Mohamed Muda and Ibrahim Baba in Reading; Jamaluddin Daud in Salford; Zuriati Zakaria in East Anglia; Bohari Yamin, Fauzi Yusof and Jamil Jais in London, Nik Idris Yusof and Bukhari Anuar in Australia, Ikram Said (early Apr) and Siraj Omar in the USA; and also my juniors Harun Hamzah, Maimunah Sokro, and Laily Din, and several more juniors who I would know when they return (I was told that the recruitment was including chemical engineers). UKM main campus in Jalan Pantai Bharu, my alma mater, formerly a Teachers Training College. The tallest G Block was built in 1975, it housed the science Deanary. UKM's Sect 16 Campus, the former Kolej Islam Malaya, PJ, the home of FPI, and Chemistry Department. 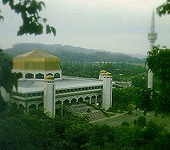 Dewan Malik Faisal (DMF) is on the left, superimposed foregrounding the mosque. The main building is on the centre. Since 1975 more temporary wooden 'pre-fab' building were erected, from one of which this picture is viewed (incidently it housed my office), around the original perimeter to house the Chemistry Labs, which had fully moved here since 1974. Sect 17 housing estate is in the back-ground. 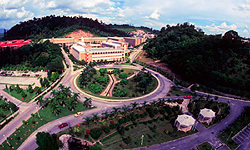 In Bangi, UKM permanent campus, began to metamorph in 1977. I had its first glance Mac 25 Fri, after paryer in FPI, with Dr Akram and Dr A Hamid Othman, while seeing land site belonging to Ustaz Idris in Sg Merab he said he was chopping up for sale. My first lecture in Bangi was Dec 27 Tue, Kenegaraan, 3A-303, the science general knowledge - plastic in particular, to non-science students; all of them have to take this paper. The paper was a continuation that I had given in the previous semester in ODT Pantai Baru. On top of teaching SK370 and SK470, both polymer chemistry papers, and SK322, a physical chemistry paper, I had times to do some demonstrations in Pusat Asasi Sains UM (for one session to ca. Mar 1978) and also UPM (only a month from Jun 15, Dr Jamjan did not like it). I tried also with some documents on USM's out-campus tutor Jul 20 Wed, including a permission from VC, but somehow, nothing kicked. By March, I had all my 1974 contacts reestablished. Notably Abdullah Hj Hakim of RTM who introduced me to Shaari Awang, the then producer of 'Sains dan Orang Ramai'. This programme took me to late 1979, when I was due for UK again. I had also established my rapport with the publishers like OUP, Fajar Bakti, Hienemann, Longmans, FEP which all had loads of job for me which I did it at home. I wrote many articles to Dewan Msyarakat and regularly in 1977 and 1978 in Widya, a megazine published by Adabi, edited bt Kashim. By late of the year, En Yusof of Fajar Bakti had trusted me in writing a STP book. My posting for the lecturership was interviewed Feb 24 Thu, in the ODT's Foyer meeting room Pantai Campus; the registrar En Ghazalli, the VC Dr Anuwar Mahmud, the dean Dr Noramly, and the head of dept Dr Jamjan were asking; mostly were about education and expanding my MSc work into a research project. April 18-28, the department ran the LA Course; Md Soot, Pauzi and I were given the specific task to accompalish. The openning was April 18 Mon in the lecture hall of FPI; Dr Baharuddin Yatim, the acting deputy dean officiated; from the department: Dr Jamjan and Dr Akram. The course practically was to reinforce the LA with basic chemistry knowledge they were supposed 'to master' for the job; and the practical too. The emphasis was more on the theoretical, not so much the practical, so that they could appreciate their daily chorus. My second mission was getting to know Azizah to the closest point, and likewise to make her know me. I met her before unintentionally only once, probably in 1972 at my home. Her family was invited in a kenduri my mother offered. She came with her mother and two of her youngest sisters. It was not easy for her to assimilate herself into my life from the point she was married to me since I had my life before it and I had to continue from it to go on. It took quite an effort to let her know that a life is made, not born, and I made my life from many different elements probably very different from hers. Dr Kardinal Kusnaeny; Dr Chia Hong Djin (2k pic); Dr Sanusi Janggi; Dr Zainal Abidin (2K pic); the first two were my teachers in 1971 when I was reading geology in my first year. Azizah had no intention of continuing her study, and I did not insist her to do so either, so she began her life together with me, doing what I do to help me. On normal working days I would returned home in the afternoon to fetch her, so that in the evening she and I could joined others to play bandminton either in Dewan Malik Faisal, Section 17 or in the Gymnasium Jalan Pantai Bharu. Dr Ariffin, and Dr Zainal of Physics Department (I negotiated a deal with him May 10 Tue, to rent his house in Subang Jaya in Oct when he was going to UK if Ramli Jaya concede, but I canceled it Jun 6 Mon because it was very far away from my brother Num working place), Dr Chia and Dr Kardinal of Geology and Dr Sanusi of Biology were among our contant playmates. Azizah played very well that some members of the faculty tried to sneak her, but failed into the faculty team in the interfaculties rally. The friendship was very warm in general; many times families got together, but alas, at that time every one was young, nobody yet busy with the kiddos, or with only one or two very young kiddos like that of Dr Shafie Embong. At home she helped to her best when I was doing the translations, decyphering my lecture notes, or even taking dictation when I started scribbling manuscripts. I bought her a watch, the first such thing since we got married five months ago, a manual oris at a shop in State PJ. She was not happy with that, the watched kept on being ferried to the shop many times to get it ticking continuously. Getting to know Azizah in 1977. The car of the time was Fiat 124ST, but I could not effort one; it cost about 12K, I did not have the 'overhead' 5K. So I settled for a Hillman Avenger in Wearn's Brothers PJ New Town, which cost a little more than 7K which was just covered by the university loan. At home Azizah learnt a lot while meeting many people, many of them were my friends who I knew in SAS, in UKM, and in Britain, before I knew her. She did not tell me of any of her friends that I could accompany her to see, probably then she did not have many of them staying around. We went around a lot, especially when we had our Hillman Avenger Super BAU5162 from February 1. I took her to cinemas, eating, dining, sight-seeing many times in PJ and KL, and to the Annual Faculty Dinner on March 28 Mon in The Regent, in which the minister of Welfare (Datuk Aishah Ghani) was the Guest of Honour. Her sister Noriah was in HBKL's Nursing School who visited us very often. My cousin Fatimah was staying in Sg Kayu Ara, down the road, while accompanying her husband in the third year of FPI. Many times they spent with Azizah at my home, and became a site too whenever relatives arrived from Terengganu. Ibrahim and Azizah who I met in Salford were staying in DU also 87, 20/13, May 19 Thu and obviously in Custom HQ in Damansara Town. So did Dr Mohamad Embong of Biology Department whose wife was very keen to befriend to Azizah. Raja Daniel popped in many time at my home after his return to LLN in Bangsar from Reading. Razali, Fatimah's younger brother in his third year in FPI, stayed with us from Jun 5 Sun until the FPI moved to Bangi in mid-oct. He brought home many friends, some of them Azizah knew. A son of my cousin, Muhamad Endut (Awang) was also in his third year in FPI; they stayed in Pantai Dalam. My other cousin, Umi Kalthum and her friend-relative Nawiah were in Maktab Perguruan Islam, Lembah Pantai since May 3. They stayed in Kerinci flat and attended the class in MPI temporary site next to UKM. My other cousin, Ahmad Yusof, returned from Indonesia on April 15 and work in Yayasan Selangor, to join my peripherals in KL. He stayed in a rented room close to his working place. On many occasions I visited Abang Sehat, then in Subang Airport Police Station, with whom I stayed with when I was in the first year in 1971. On the other side, we were the stop-over points whenever relatives from Terengganu were visiting or on some matters in KL. In short I had to go to Pasar Borong to buy stocks in bulk, almost monthly. And we were very happy with the function of focal point. The residual 'volunteers', Dr Roger Card (USA) and Dr Paul Rusmussen (Canada) were farewelled in private Mar 8 Tue in Devana Grill in Wisma Selangor. The so-called two-ways cooperation under IUC, culminated in the visit of Dr Allan Fitton, the post graduate tutor in Salford who was very accustomed to UKM since 1973, through to 1976. I was in Salford when the negotiation was carried out between Prof Philips and Dr Noramly and Dr Ghazali. Dr Fitton stayed in University flat in Pantai Bharu from his arrival at about the same time I returned home in early oct last year 1976. Initially, his family accompanied, but after a few weeks, he was alone (to the end of his one semester tenure; he said his wife was not well). He gave us a bachelor dinner Mar 5 Sat. I returned the dinner in my home Mar 12 Sat. Dr Shafie Embong and family accompanied to make it merrier. The department farewelled Dr Fitton, together with Dr Sjamsul, Mar 17 Thu, in the department tea room; I was asked to say something, and I did, and it was mostly about a hint that some of us were returning to UK for our doctorate. I sent off Dr Fitton at Subang Airport Mar 19 Sat. Haake Rotovisko RV3. 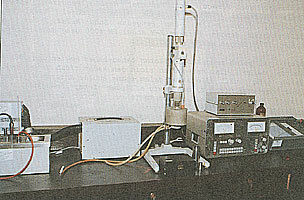 I used the RV2 version in all my research in Salford 1974-1976. It thus very easy for me to master it and taught it to the LA Jamil Ujang since mid Mar. During my interview in Feb about expanding my research projects, this instrument was in my mind; plus all the abundant cashew trees throughout the east coast. When the new session 1977/78 started on June 6, I was given to supervise three Hons Students, Zainiah, Nik Noraini and Siti Hajar, my first supervision; obviously they were doing something about cashew gum on the Haake Rotovisko RV3; the latter somehow conceded after the first semester. The degree conferement was held on June 25 in Parliament House, I attended for the first time as a staff, with my degree gown I bought from UK, the delivery of which May 24 Tue was assisted by Custom clerk Mohamad Awang, my SMPM class-mate who I met in Mar (20 Sun - I took them to my home in DU) in Selayang and took me to see Ismail Mohamad, one of the 9-pax in 1966, then a JKR technician in KL, also staying in Selayang. 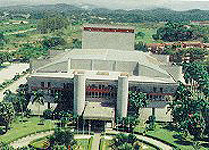 The degree conferement in the Parliament House was the last (the first was in 1973); next year it would be in Bangi, the permanent campus. I managed to locate and visited (Nov 12 Sat) the other 9-pax, Abdullah Yusof at 48, Lorong Sendawa, Taman Gembira, Klang, then was in LLN; and from his information got another (Nov 13 Sun), Mohd Embong in AYPM Bangsar (attached to MAS); on this day I took him to get reunited with Ismail Mohd in Selayang; he ended up in my place, with the visit of Amin who I knew in UK, till mid-night. The other 9-pax I managed to get reunited this year was Omar Taib Jun 17 Fri night while touring UM Pesta Konvo; he said he was in Kelantan Agriculture Dept. Before that after Jum prayer in the national mosque I met Wan Mohamed Musa (telekom) my SMPM school mate, and with Ramli Jaya on tour to visit friends in UTM, Gurney Rd: Hamdan, Ramli Hitam and Md Sum. We visited Azahari Salleh, my roommate in the Second College 1973 very often in their home in Cheras; all were queuing to go for another trip for the doctorate. Apart from Wan Ahmad Jusoh, I also met Alias Mohamad (BBMB), my senior room skipper in Padang Midin 1965-66 who stayed in SS20 (alpha), and Ngah Awang (working in volvo machinery distribution com in PJ), his class mate. My own brother Num left us on April 30, saying that he had to accompany a friend in Jalan Gurney, close to his working place; then told me that he had moved to Ampang on July 1. By the day my sister Mek Maziah got married on September 18, my brother Num returned home with a wife who he secretly married in late July or early August. Since I had not been at home for a very long time, on my holiday break in early July, my mother asked me to tend to my father grave which was not very far from my house; I bought the tomb stone with my elder brother Abang Ra. My youngest brother Adik Jo who was born in my absence and five months after my father's death in 1972, then was five years old. Late of the year, elder brother of my sister Mek's husband, Muhamad and his cousin, Zaini move to KL in an effort to make a new living, and they started off with me. They first tried their luck in the security area; got both of them by themselves, and to settle in Ipoh Road. When I went there to send their belonging, I saw the place was very filfthy, practically swarmed by mosquito. I took them back home and helped searching for a better place around Kayu Ara, down the road. They settled down by the year end in a rented 'hut' on a big piece of land, more than perfect for them. Zaini's family joined not long after that; and Azizah was very confortable with them. 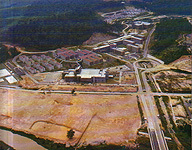 UKM permanent campus would be in Bangi. 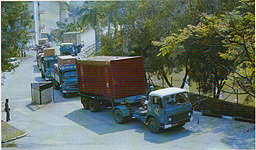 Constrauction began in early 1970. The first move began in mid Oct for Arts Faculty and Islamic Studies Faculty. Medicine would remain in Kuala Lumpur Hospital until one for UKM is built, the location of which was to become a controversy for the rest of UKM's life. In mid Oct, non-science faculties moved to Bangi, leaving the Pantai campus for Science. Chemistry Department moved to Pantai officially Nov 16 Wed, although all lectures had been in Pantai since the first day of 1977/78 session. The premise was actually a bungalow used to housed the warden of previous college. Before we moved in, it housed the History Dept of the Arts Faculty. I stayed in the master bedroom, and shared with Sri again, as she intended to stay close to the dept office. We continued to share the telephone line which was put on the book rack high enough to function as the partition. The section 16 campus was left to Maktab Perguruan Islam to begin their life; except the labs that UKM built were still in used either for the practicals or for the hons students to carry out their projects; so I still popped in the area. When we moved to Pantai, the Head was Dr A Hamid Othman; Dr Jamjan was on loan to USM to chair the school of chemical sciences, the loan USM actually never return back. Chemistry Department at the bungalow. 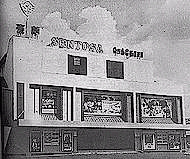 It stayed to 1982, then moved to Bangi. This was 1981 picture; all the academia were 'local' and in their full flesh doctorate. Front row from left: Dr Maimunah, Dr Ibrahim Abdullah, Dr Ikram Said, Dr Bohari Yamin, and Dr Ibrahim Baba; Back row from left: Dr Laily Din, Dr Murtedza, Dr Harun Hamzah, Dr Nik Idris, Dr Siraj Omar, Dr Bukhari Anuar, Dr Jamaluddin, Dr Wan Mohamad Muda, and Dr Mohd Wahid Samsudin. 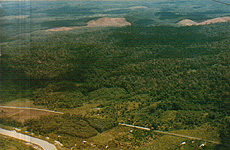 In 1977, the academic composition of Science Faculty mutated to bear several units; chemistry remained a department, but directly under the faculty were Industrial Chemistry unit, Nuclear Science units, Electronic and System unit; Statistical unit, Computer Science unit; a total breakup in the biology department into Zoology, Botany, and Food Science; geology remained one piece. The first time Shawal WITH Azizah was 1977 Sep 15 Thu 1 shawal 1397, in Trg vicinity of our homes - In my home in PA the Shawal night, from the eve iftar. Through to solat Idul Fitri pagi Shawal di Masjid Kalang Arang. Only after that gi PD to Azizah's place. We returned home to Trg from Damansara 1977 Sep 10 Sat 21 Ramadan 1397. A night in Kuala Sentul, at AbangMat place. Arrived in my place the next day and unpacked there for the night. And for the FIRST TIME Azizah spent Shawal not with her family. Which was a rather bitter for the beginning. And for the first time her family felt they were loosing Azizah, their eldest child. 1977 Sep 18 Sun 4 Shawal 1397, the wedding of my sister Mek Maziah to Yusoh. Nephew of MokSuChik balik Hulu, the place a few hundred meters to the sun-set of my house, where I spent a considerable time to play with the local kids there. I normally receded when they all went to the river. I was not quite familar with the river bank. 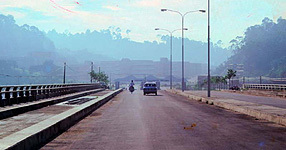 I preferred Pengkalan Arang, or Pengkalan Luas. It was a very hectic, and fun year that unbothered by our anniversary, I did not realise or very ignorant to realise that Azizah concieved in August. On September 21 Wed 7 Shawal, on the way back to KL on top of Bukit Tinggi while descending the narrow winding road, the car was skidding toward the deep ravine, stopped only by the road bunker on time before a full loaded timber lorry arrive from the opposite direction. Azizah was traumatically shocked by the near-accident. On the very early morning of September 27 Tue 13 Shawal she complaint of a very unbearable pain in the tummy. I took her to the University Hospital in the wee hours, to be diagnosed by an on-call doctor as worm-infestation and treated out patient. But, three hours later, at home she had another strong pain, and she was in the pool of blood; she was admitted, she had a miscarriage. She was discharged Sep 30 Fri 16 Shawal. The day Ali won on point against Earnie Shavers in New York (Sep 29). Perhaps, Pauzi was the first among us to become the father, Jul 24 Sun with a baby girl. He had his wedding day at about the same time I had. Ending the year, beginning Muharram, I took Azizah to the engagement of Md Soot, on December 4, in Ipoh, to a girl, a cousin of Husin Wahab, one of my dear friend in SAS 1970 who I lost contact with for a while when he went to Indonesia after STP.